I was born in Highgate in 1948 and have lived in London all my life. My first job was in a brass foundry, making reproduction period door furniture, candelabra, and such like. I then trained as a goldsmith, and worked for many years in the jewellery trade, starting in manufacturing, then moving into the retail side of the trade. I started playing pop music on the guitar in the early ‘sixties, but soon became more and more interested in traditional folk music, attending many folk clubs in and around London. When I saw musicians playing other instruments than the guitar, I wanted to do the same. I really wanted to play an Appalachian dulcimer, but I could not afford to have a luthier make one for me, and there were not many shops selling folk instruments back then. So my only choice was to make one for myself, which I did back in 1968 with the help of a book by John Bailey. My first instrument worked well enough, and this encouraged me to make some more. I had the nerve to take one of my early efforts to John Bailey himself, who lived in Wembley at the time. He had been a teacher, and it showed in the patient way he helped and encouraged me, and I thank him for that. I continued to make instruments for myself and for friends, exploring the fascinating variation in sound and tone that could be produced by instruments made of different woods and designs. In 1987 I was made redundant, and I finally had the opportunity to do what I had wanted to do for many years: instrument making became my full time occupation. 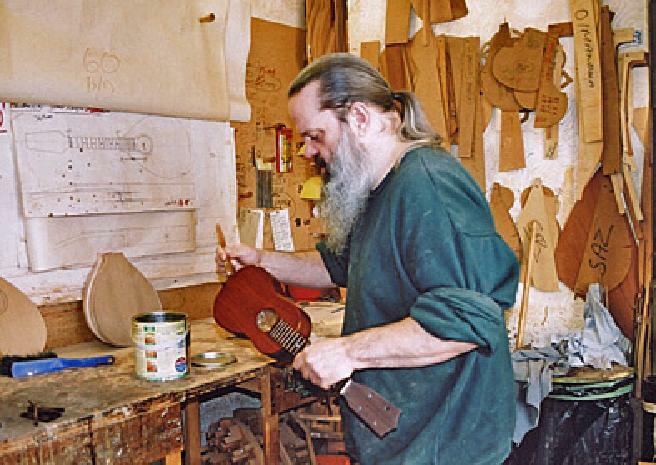 Over the years I have made many different kinds of stringed instruments, for both professional and amateur musicians, mainly for folk and early music. I always keep a good selection of instruments in my showroom so customers can come and select the instrument they want from my ready-made stock. I can also make instruments to your own specification. Please contact me by phone, all visits are by appointment only. All my instruments are made with the practical musician in mind, usingthe best quality wood, never laminates or plywood. Most instruments have mahogany neck, back and sides, these are then stained to a dark wood finish. Soundboards are spruce or redwood cedar and occasionally mahogany. Fingerboards, headstock, and bridges are made of rosewood. All machine heads are best quality enclosed type and are made by Ghoto.